Mr. Chandrakant Salunkhe has commerce background with intensive experience in Business Management. He is the Founder and Chairman & Managing Director of Macro Group of Companies established in 1991 at Mumbai. The group is involved in Manufacturing of Packaging Machinery, Equipment and Industrial products. The Group is also involved in Exports, Marketing, Distributorship and Franchising as well as importing Capital Goods, New Technology, Innovative and Industrial Products. ◉ Salunkhe Packaging Pvt. Ltd.
◉ Geoptech Solutions Pvt. Ltd.
◉ Salunkhe Exports Pvt. Ltd.
◉ Macro Corporate Services Pvt. Ltd.
◉ Bricks Marketing and Promotion Pvt. Ltd.
Mr. Salunkhe has also founded the following organisations to integrate Small and Medium entrepreneurs from manufacturing and service sectors. The objectives of these organisations are to support and assist entrepreneurs from various fields for business growth and expansion. He constantly puts efforts to resolve the issues and problems of the Industry and SME Sector. 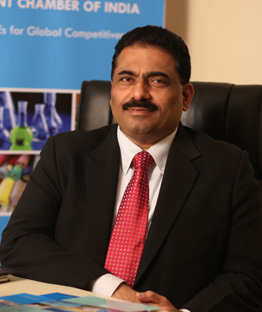 Under his leadership, the above organisations have been organising various national and international level activities for the promotion of Industries and SMEs, Investment, International Cooperation and providing interactive and networking platform for identifying new business opportunities as well as imparting knowledge and education. Mr. Salunkhe has been speaker at various international Conferences and Seminars namely, G-20 Conference on SME, SME Assembly by European Commission, SME and Industry Conference by Malaysian Government, Government of Turkey, CCPIT-China, UK, Canadian and USA Organisations and presented papers on SME Sector, Manufacturing, Finance, International Trade, Packaging Industry and Young Entrepreneurs / Start-ups. Mr. Salunkhe has also initiated various Bi-lateral Trade Promotion Divisions for enhancing connectivity between Indian and overseas entrepreneurs and SMEs, investors, Government Agencies, Multinational companies and other industries from UK, USA, Europe, Canada, China, South Korea, Japan, Gulf Countries, Turkey and African Countries. Mr. Salunkhe frequently travels to USA, Canada, UK, Israel, various European Countries, Japan, Australia, New Zealand, South Korea, Hong Kong, China, Turkey, Malaysia, Thailand, Indonesia, Vietnam, Egypt, Singapore, Bahrain, UAE, South Africa, Oman, Mauritius, Qatar, Taiwan and Saudi Arabia for development of business, connectivity with heads of Organisations, Government Agencies and to address and attend various conferences as well as to participate in Exhibitions and Trade Fairs.